One of the frequently asked questions I receive from people I meet here in Brazil is why I decided to come to Brazil and spend six months. The answer to this question is somewhat complicated and not something I can express in 140 characters with a couple of hashtags, so I am devoting this post to answering this question, a question I am not sure I completely understand the answer to. The answer evolves each day that I stay here in Brazil. Sometimes what gets us interested in a country is purely situational. Somebody introduced you to a place or you read about it in a book and you wanted to learn more. Maybe you had a crush on someone from a certain country that encouraged you to learn more and your interest in the place endured long after your passion for the particular person. My story that brought me to Brazil has several influences and factors which I will attempt to explain here. Since I was a boy, I’ve always enjoyed traveling and learning about other countries. I entertained myself for hours studying atlases and maps. I borrowed books from the library about other countries and even books about how to speak foreign languages. Often I would develop an interest in one country in particular for reasons I still can’t explain, possibly because I liked the sound of the name or that it happened to be my favorite color on the map. I took French in school, for a number of reasons: 1) Spanish seemed so common that I could learn it anytime; 2) the “smart” kids took French and the “dumb” kids took Spanish (because it was supposed to be easier). Now I see Spanish as much more useful than French and wish I had learned it in school when I was younger. I took French classes up through my freshman year at Davidson College. I think I always thought I would pick it up again with additional classes, but I never did. A good friend of mine at Davidson, one with whom I shared a love of travel and interest in geography, took Spanish there and studied abroad in Seville, Spain while I was in Scotland. After college, we worked at the same telecommunications software company in Nashville where he worked on the Spanish customer support team and got to perform software trainings in Mexico City and Buenos Aires, while I got to go to exotic places like Peoria and Des Moines in the dead of winter. Today, my friend works in Washington, DC as a lobbyist for the Latin American Chamber of Commerce, putting his language skills to use every day. I’ve always been somewhat envious of his career trajectory, and wished that mine had involved international travel and foreign language skills. However, my career path has remained firmly rooted in the United States. After a couple years of software consulting, I studied Southern US history in graduate school and then went to law school in Tennessee. After graduating law school, I practiced corporate restructuring and bankruptcy law at large law firms in Nashville and Atlanta, but my work rarely involved anything international. However, after years of being a student, I was able to resume my international travels, trips made possible by lucrative but highly demanding jobs. In those years, I visited Germany, Austria, Switzerland, the Czech Republic, the Netherlands, Belgium, Italy and France. Eventually, I realized that I had been to Europe quite a bit and that there was so much of the world I wanted to explore. I became interested in visiting South America, particularly Argentina, perhaps because its European-influenced culture makes it a good “South America for Beginners” place to visit, but also because I wanted to visit Patagonia with its glaciers and stunning landscapes. I took a trip down there in 2011 by myself and throughly enjoyed it. Before taking the trip I started teaching myself some Spanish with podcasts, Rosetta Stone and internet resources. I was able to speak some Spanish on the trip. Before and after going to Argentina, I thought about what it might be like to leave the practice of law behind, live in Buenos Aires for a time, become fluent in Spanish and develop a more international career for myself. In planning my trip to Argentina and afterwards, I bonded with a couple in Atlanta, two super guys who have become treasured friends of mine. Having taken trips to Argentina as well, they gave me advice on where to stay, what to see and what to do. While I had them over to my place in for a small pool party, we discussed that we really wanted to visit Brazil, especially during Carnaval, and the plans for my first trip to Brazil were born. Two other guys joined us on that trip last year. We spent two days in São Paulo, four days in Florianópolis and four days in Rio de Janeiro. While my plans for the trip were underway, I mentioned to a couple friends of mine in Washington, DC that I was planning on going to Florianópolis for Carnaval. They had been to Florianópolis just that year over Carnaval and enthusiastically recommended it. One of them introduced me and my friends to some of their Brazilian friends via Facebook. Once we arrived in Brazil, one of these friends especially took us under his wing and introduced us to friends of his while we enjoyed some wild and crazy times at the beaches and baladas in Florianópolis. 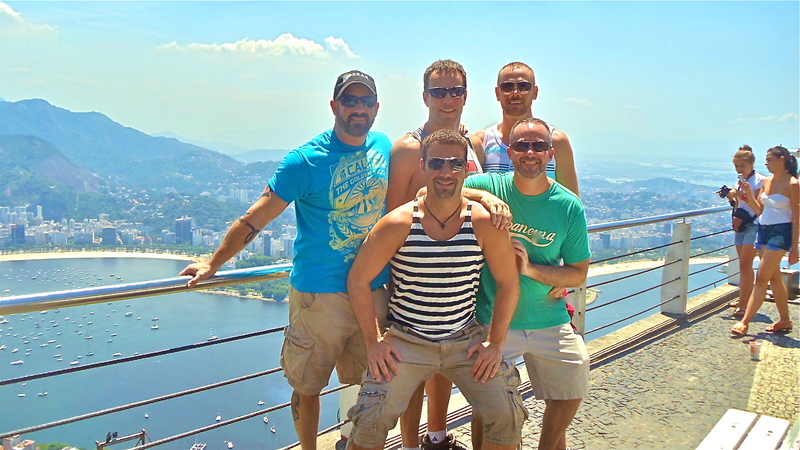 We also had friends of friends show us around Rio de Janeiro and take us to a Carnaval parade at the Sambodrómo. I learned a little bit of Portuguese before going and was our group’s designated language expert. The trip was an incredible experience. We came away with lots of new friends and unforgettable memories of Brazil. Because of these new friendships and our positive experience there, my expatriate dreams began to shift from Argentina and to Brazil. In the months after my first trip to Brazil, it became evident that much of the world’s attention would be focused on Brazil in the years to come, not only because of the World Cup and the Olympic Games but also because of the protests taking place in the country. It is a country that shows much economic promise in spite of the many problems it faces. I realized that there would be a growing demand for people who have the ability to understand and interpret this complicated country. I began focusing on learning Portuguese instead of Spanish. Lots of Americans can speak Spanish, but not as many are able to speak Portuguese or really know anything about Brazil. I fancied the idea of becoming a Brazilianist. Portuguese is a beautiful language, spoken or sung. Having some background in Spanish and even French certainly has helped as they are all Romance languages derived from Latin. Knowing English helps as well because there are so many words in Portuguese that are nearly the same if you modify some letters. I figured that I would need about six months in Brazil to immerse myself and really learn Portuguese well. Right now, I’m about half way through my six months and I still find the language challenging. While I am not sure I will necessarily be able conduct business in Portuguese when my time is up, I have enjoyed the ability I now have to access the culture and literature of this incredible country as well as to interact with Brazilians, even if the conversations are limited by own knowledge. I believe that I am also attracted to Brazil because of its interesting history, which at times, parallels American history, particularly that of the American South, a region whose literature and history I am well acquainted with. My first trip to Brazil educated me about its fascinating past as well as its present-day problems and complications. In spite of its flaws, Brazil remains a fascinating place to me, one which I enjoy learning more and more about. Aside from the natural beauty of the country, the language, the history, the culture, the language, what makes this an ongoing love affair for me are the Brazilian friends that I’ve made along this journey. It is these friendships that attracted me here and ultimately what have kept me here. This can be an intimidating country to navigate for a foreigner, so I’m glad I’ve had lots of helpful friends to guide me. Brazil has given me an opportunity to reinvent myself, live out lifelong dreams and experience things I never would have been able to experience had I never dared myself to embark on this adventure. I really enjoyed reading this, good luck over here in Sao Paulo!